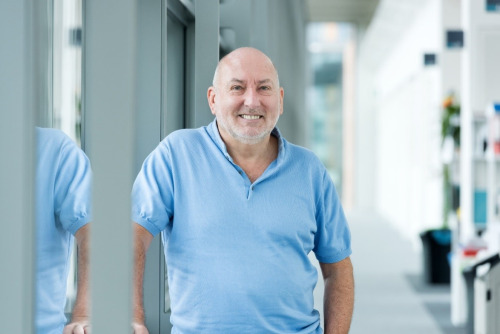 Professor Stephen West of the Francis Crick Institute has been awarded the Cancer Research UK lifetime achievement award for his pioneering work in DNA repair, today (Wednesday). During his career, Professor West has made key discoveries about the molecules involved in DNA repair. His work has been integral in accelerating our understanding of the BRCA2 gene in inheritable breast, prostate and ovarian cancers – a genetic defect that puts people at a higher risk of developing these diseases. Professor West said: “For the past 30 years, it has become increasingly clear that many cancers stem from defects in DNA repair mechanisms, so a better understanding of the fundamental biology is vital for working out new ways to tackle the disease. We are delighted that our work has contributed to the challenge to cure cancers. Professor West’s career began in the late 1970s at Newcastle University, where he earned his PhD in biochemistry, before moving to Yale University in the USA. It was at Yale where he worked with one of the early pioneers in the field of DNA repair, Professor Paul Howard-Flanders. Professor West moved back to the UK in 1985, joining the Imperial Cancer Research Fund, which later became Cancer Research UK, to set up his own laboratory. He currently works at the Francis Crick Institute, London – a biomedical discovery institute dedicated to understanding the fundamental biology underlying health and disease. Professor West said: “Our research is focused on the isolation and characterisation of the key factors that promote DNA repair, and the aim is to understand exactly how damaged chromosomes are fixed. Once we know the detailed mechanism of repair it becomes possible to see why things don’t work properly and try to manipulate this knowledge to provide cures. The award will be presented to Professor West at this year’s National Cancer Research Institute (NCRI) Cancer Conference in Glasgow on Monday 5th November, after which he will deliver a plenary lecture.